I’m going to get straight to the point: Epic Mickey 2 is not a good game. It’s frustrating to see a solid gold concept steamrolled by the lack of player guidance, superficial mechanics and a poor camera system that has no right to exist in the current state of video games (I mean, we solved this problem, right?). The game does nothing for the Wii U except perpetuate the fear that most games will fail to use the Gamepad to its true potential and rely on it to display pause screen functions and features. Epic Mickey 2 is a third person platformer that has the player navigating through a series of puzzles in order to advance to the next area. Set after the events of the first game, the world of Wasteland is besieged by a series of earthquakes from an unknown source. The Mad Doctor (from the Disney short of the same name) approaches Oswald claiming to have mended his ways and wants to help avert catastrophe but the wary inhabitants call upon Mickey to return and help restore Wasteland’s glory via Yen Sid’s magic paintbrush. 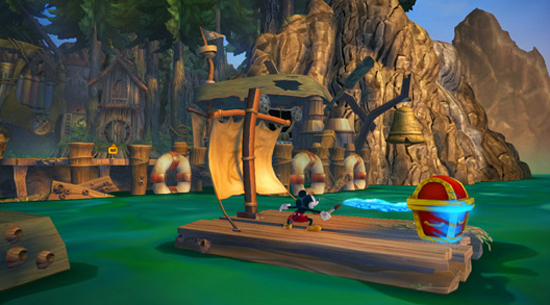 Much of the game is spent activating certain machines and devices that require orb-like power spheres and using the paintbrush to uncover and repair objects and areas or battle against enemies inspired by long forgotten Disney properties. Combat is a largely superficial mechanic because all Mickey has to do is spray foes with the magic blue paint until they become friendly and non-violent. Larger enemies require the exploitation of weak spots in order to expose the creature inside but this proves to be more trouble than it's worth because finding out the correct sequence to expose weak points is not intuitive. Aiding Mickey in his quest is Oswald the Lucky Rabbit who will assist his friend by activating switches and paralyzing enemies with his handy dandy remote control. In a single player game, Oswald is controlled by the AI and the player has little command over his actions outside of a few contextual actions such as activating switches, using him to cross large gaps or stunning enemies. Outside of these instances, the AI is barely competent, evidenced by Oswald’s knack for getting stuck on the environment or not being around when needed resulting in having to wait for him to respawn near Mickey’s position. 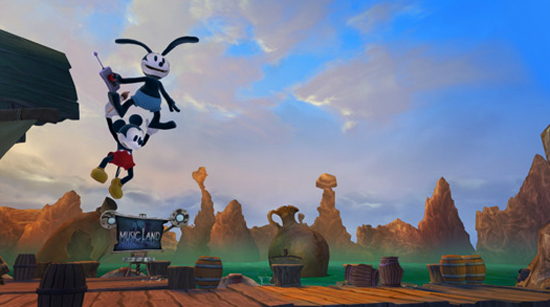 Mickey and Oswald’s travels to and from different areas in Wasteland is achieved by playing through a series of short, 2.5D levels made up of trashed Disney merchandise. At first, these transit levels are nifty because of their “spot the familiar souvenir” angle, but they soon outgrow their welcome when they have to be played through over and over. If there’s anything that plays in Epic Mickey’s favor, it is how the game incorporates forgotten Disney characters and objects into its world. Many enemies, objectives and locations are inspired by all sorts of Disney-related places and films that true aficionados would appreciate. There’s an enemy type designed after the floating robot Vincent from The Black Hole as well as old Mickey Mouse records and cassette tapes and TRON-related pinball machines (although this seems a little out of place now that the franchise has been brought back to public attention). One of the Mad Doctor’s minions is the Ladybug float from the Main Street Electrical Parade. Old Disney characters, such as Claribel, the Three Little Pigs and other spindly characters from Walt’s Silly Symphonies have a home in Wasteland and I found it pretty neat to see them again. Apart from the vast collection of obscure Disney references, Wasteland doesn’t offer any sort of complex visual level designs. The game is cartoonish in appearance (as it should be) but I find 3D rendered Mickey and his long, gangly arms to be more than a little upsetting to look at. Some characters just don’t make the 2D to 3D transfer all that smoothly. Epic Mickey 2 is no fun for a great number of reasons. The camera is definitely a problem and reminded me of the old Tomb Raider days when the majority of the game was spent fighting with the camera just to get a decent view of the area ahead. There were moments in which the lock-on camera operated in such a way that would allow background objects to pop in and cover the entire portion of the screen resulting in frustrating combat scenarios. For some reason, the game opted to use a low angle camera during an early puzzle sequence that required Mickey to turn a series of switches to create a path out of a field of lava spewing spigots. Because of the angle, there was no way to tell whether or not I had the switch in the right position unless Mickey step away from it. There’s also a problem with the game reading the player’s input. The A button on the Gamepad acts as Mickey’s Jump button and Action button - not a big deal by any means. Plenty of games do this. The problem lies with some poor contextual coding that occurs whenever Mickey finds himself near an interactive object. Every time I approached an interactive object and prompted to push “A”, Mickey would always jump and only after the second time I pressed “A” would he grab hold of the switch/orb/whatever. While it didn’t happen every time, I’d say it occurred about 95% of the time. What really damages the experience is the incredible lack of guidance. Although paintable objects are highlighted by a ghost-like image of themselves, it is difficult to determine what can be destroyed using paint thinner, making it easy to miss hidden areas, collectibles and valuable puzzle pieces. Mickey’s gremlin guide and the Wasteland inhabitants will tell you what needs to be done but those instructions are often vague and misleading. I’d like to think that I am a competent gamer who can easily find their way around, even more so with proper pathfinding, but when I found myself lost in the game’s opening hub world, well, I knew that Epic Mickey suffered from some serious problems. Despite the Gamepad’s persistent map features that can identify Mickey and Oswald’s place on the map, points of interests, side quests and exits, the map did little to helpfully convey relevant information. When I write a review, my goal is to help the reader determine if a game is worth their time. Time is valuable and is often constrained by a number of reasons, whether they be personal/social concerns or even a busy release schedule. I want to be as explicit as possible and say that Epic Mickey 2 is not worth your time. A bad camera system, a poor help system, bad AI and the lack of substantial Wii U features make this game dull, uninteresting and frustrating. I stopped playing Epic Mickey after several long play sessions because I wasn’t having any fun. In fact, I dreaded playing it. Each instance of turning on the Wii U and loading the game was met with the same heavy sighs and stooped posture I typically reserve for visits to the DMV. At the end of the day, Game and Wario is a compilation of a few good and a lot of mediocre experiences. You can see a ton of potential in a great Wario game for the Wii U but Game and Wario is not that game. I’m pleased to say there’s finally a game that makes Wii U worth owning. Needless to say, I found Power of Illusion to be an incredibly disappointing game. There’s nothing fun about the experience and any warm, fuzzy feelings of nostalgia brought upon by the design, soundtrack and concept are ruined by clunky and infuriating gameplay.